Charleston Girl: I want, I want, I want!! 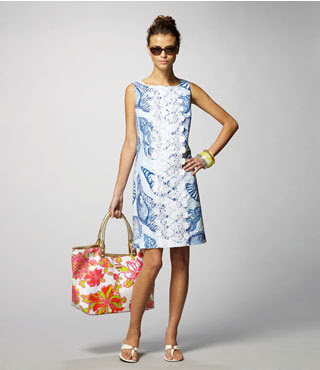 I have not typically been a Lily Pulitzer fan - mainly because of the prices. I love the Lily prints, but I sometimes feel like they are way overpriced... but I think being in Charleston is having a Lily affect on me. I'm tempted more and more to get some Lily lovelies. This year I bought two Lily dresses and a bag on RueLaLa. I guess I need to get on that lottery hobby I've been meaning to take up. Totally one of the dresses I'm dying for but I can't bring myself to pay full price.. I don't pay full price for anything anymore hah. you need to check out my friends Sandi's store web site. She carries Lily P and ALWAYS has a good deal/sale on the line. Yep, you need it!! I support this purchase! I'm telling ya, once you get a little taste of Lilly you just cant stop! It's addictive!